Can China Be the Saving Grace at COP24? Beijing’s capacity – and willingness – to lead on climate change are being tested. 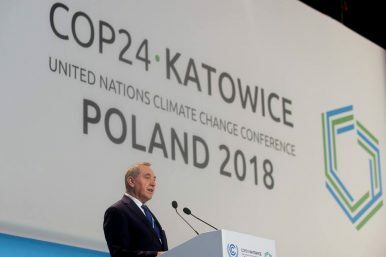 The annual UN climate change conference is in full swing; representatives from more than 100 countries from across the world have gathered for COP24 in Katowice, Poland. When prior meetings saw success, the major reason has always been collective action supported by the major powers. However, this year’s Conference of Party meetings, which will end on Friday, threaten to be majorly unsatisfactory with dissatisfying outcomes, especially due to the incalcitrant behavior of some of the major oil countries. With just a few more days left before it is concluded, could China still make a difference in the time left? The COP24 meetings began with the introduction of a scientific report prepared by the Intergovernmental Panel on Climate Change (IPCC). According to the report, the desired goal of limiting global temperature rise to 1.5 degrees Celsius is now completely off track and the world is headed toward warming of 3 degrees C in this century. To get back to the 1.5-degree target, carbon dioxide emissions would have to be reduced 45 percent from 2010 levels by 2030. While the EU and the most underdeveloped countries, such as South America, African, as well as South Pacific countries supported and welcomed the report’s findings as crucial to this year’s COP, countries such as the United States, Russia, Saudi Arabia, and Kuwait have objected and even dismissed the report altogether. This lead to a serious clash over whether COP24 would officially “welcome” the report’s findings; in the end, that particular line had to be dropped in favor of simply “noting” the report. Many NGOs and countries expressed their criticism toward this move and were utterly baffled by the outcome. China, which is both a major power and a developing country, has great potential for legitimizing its position as the global leader in climate change affairs, all thanks to its rapidly growing economy and expanding clean energy sector. But still, it does face some major challenges that it needs to overcome before branding itself as the champion of the climate change fight. China is still is the world’s largest emitter of greenhouse gases and carbon emissions. Its Belt and Road Initiative is also doing no favors to the environment, as more and more coal-fired power plants are being set up in South and Southeast Asian as well as African countries. This has led to China being criticized as is more of an opportunity-seeker rather than an opportunity maker – more interested in winning global recognition at the climate change talks than actually solving the problem. Meanwhile, Li Gao, the director general of the Department of Climate Change at the Ministry of Ecology and Environment, has remarked that the leadership responsibility should be mostly borne by the developed countries. While there is logic to this — these countries are indeed majorly responsible for climate change, as they were beginning harmful emissions during the industrial revolution – it also conveniently relieves China of responsibilities. With China still categorized as a “developing country,” Beijing supports the principle of “common but differentiated” climate change goals based on respective capabilities. Undoubtedly, China has been supportive of the proceedings at COP24. And it is actively bolstering its abilities to work toward battling its own challenges and also be a global leader in the affairs of climate change. But that may not be enough to save the world. Prarthana Basu is currently working as a Research Assistant at the Institute of Chinese Studies, New Delhi.